The focus of the fourth week of DLTI was Shabbat, especially kabbalat Shabbat, the series of psalms and songs that expands ma'ariv (the brief evening service) into a celebration of cosmic unification rife with mystical interpretations. Kabbalat Shabbat was also the service I was blessed to be co-leading during the last session of DLTI, so it was a natural focus for my week on at least two levels. One of the most powerful parts of the week, for me, was Reb Marcia's teaching about the deep meanings and implications of Shabbat -- which was accompanied by Hazzan Jack softly playing guitar, modulating melody on-the-fly to match her words. I'm not going to reprint the teaching here in full; merely reading it, without the impact of voice and melody (and absent the context in which it was delivered) wouldn't do it justice. But I'll share a few of the ideas from it that are most powerful for me. To enter into Shabbat is to live in perfect harmony. All the blessings that manifest in the material world depend on Shabbat. Shabbat is the center of a six-petaled flower; all the days of the week arise out of it, and depend on it. Without that center, the flower couldn't thrive. Shabbat is the tree in the center of the garden, the nectar in the flower, the center of the cosmic wheel. Symbols of Shabbat include the moon, Jerusalem, the Tent of Meeting, the Garden of Eden, King David, the bride, the Queen, the holy apple orchard. Our practice of Shabbat restores primordial wholeness to the cosmos. It has the capacity to irrigate the thirsty world. Shabbat is a transformation inside of God in which we are actors. It transforms and modulates the flow of God into the cosmos. In order to understand Kabbalat Shabbat, you need to understand the difference between ceremony and ritual, between that which is symbolic and that which is theurgic. A ceremony is symbolic; it celebrates something that has happened. (Birthdays happen, with or without a ceremony.) A ritual is theurgic; it creates a new truth. A sacred event unfolding in the spiritual realm at that moment. (Like what happens under the chuppah: a cosmic shift.) Ritual ushers in a new reality in the material and cosmic realm. That's what Kabbalat Shabbat does. The dominant energy of the week is duality, separation. Dualism is a gift: it allows for difference (day and night, hot and cold, chocolate and vanilla, me and you.) But it also has downsides. We never really know one another. We are each existentially alone. Shabbat is the counter to that, our chance to taste the river of oneness that flows through everything. Living solely in separation is damaging, to us and to God. 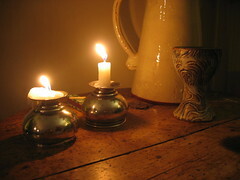 Shabbat is our weekly tune-up: a chance to repair brokenness, to effect union, one day out of every seven. Our bad karma -- the combined effects of our negative actions and energies -- drags Shekhinah, the divine presence immanent in creation, into mis-alignment, like a divine slipped disc. Shabbat is a practice of divine chiropractic work, so that divine flow can be restored. Technorati tags: religion, Judaism, Shabbat, DLTI.